Taste of Dallas is celebrating its 30th annual festival with 13 areas dedicated to food, art, music, family and FUN this summer, as North Texas’s largest tasting event readies for its return to Fair Park June 3-5, 2016. Taste of Dallas is a slice of life in North Texas, and brings together all the best of what it means to be alive here and now: delectable food, inspiring art, and music that gets you moving. For the tens of thousands of people set to visit Taste of Dallas this year, there is tasting, shopping and playing for every member of the family. New for this year are unforgettable experiences you simply must try: the all-new Foodie Experience Presented by TangoTab is an indoor event inside Taste of Dallas that includes food and alcohol samplings, chef demonstrations, and entertainment – all for a good cause. For every ticket purchased, TangoTab will be able to help feed hungry people in our community through their work with local food banks. To celebrate Taste’s 30th birthday, join us for a slice of the giant cake being prepared by Carlo’s Bake Shop from the hit TV show Cake Boss! Fair Park will be filled with beautiful colors, as Taste of Dallas will feature artists whose talents in all mediums – even chalk! – will have you amazed. More than 45 chalk artists will create masterpieces before your eyes on the sidewalks, while others show their impressive works in The Gallery. Love handmade art? Check out the new Etsy Dallas Artisan Market, where you can actually meet these creative entrepreneurs and take home some of their work. Restaurants from across the region offer up tastes of their best dishes for only $2-$5 in the beautiful outdoor setting along Fair Park’s historic Esplanade fountains, Taste’s Restaurant Island. There is something to sample from a variety of restaurants, including: Fat Rabbit, RJ’s Mexican Cuisine, Gas Monkey, South Fork Texas Steak & Crab and even Texas perennial favorite Fletcher’s Corny Dogs. More than a dozen of Dallas’s best food trucks will be in attendance as well as they pull right up to Food Truck Lane. Live cooking demos on the chef stage will entertain all weekend with performances and meet-and-greets with chefs including Chef Roshni from Food Network’s Chopped. And definitely don’t miss tasty shopping in the Taste Marketplace, where attendees can sample their way through the Fiesta Mart Mercado and from dozens of local culinary vendors. This is one fiesta for the whole family. Have kids? Bring them, since there is plenty for them to do in the Taste Kids Zone! More than 15,000 sq. ft. of fun includes FREE indoor kids’ attractions like bounce houses and slides, an interactive petting zoo, art activities, jugglers and magicians, and other entertainment on the kids’ stage. 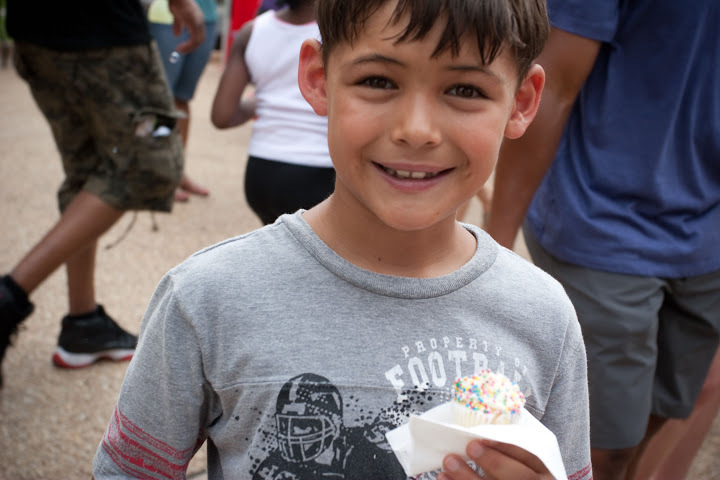 Kids 11 years and under get FREE admission to Taste of Dallas, with an accompanying parent or guardian. The experience is all part of the fun at Taste of Dallas. In addition to all the delicious food, guests will enjoy music pouring out from the Taste Main Stage all weekend long, headlined by a performance from Everclear on Saturday evening. Taste your way around the food and drinks from North Texas restaurants at Fair Park, enjoy the music, play with the kids, peruse handmade art, shop for gifts and even learn more about how to live the healthiest life possible in the Taste Health & Wellness Hub. 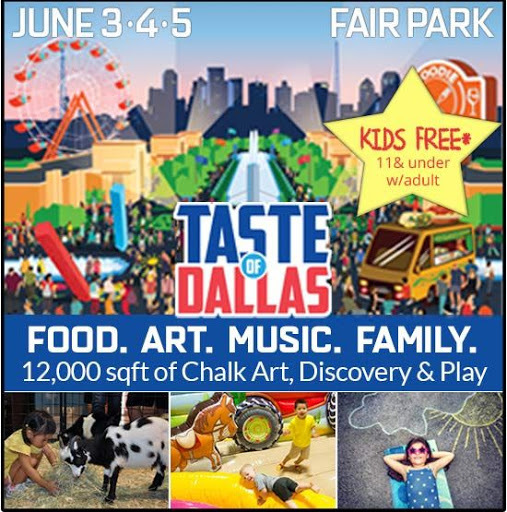 The 30th Annual Taste of Dallas is Friday through Sunday, June 3-5, 2016, in Dallas’s Fair Park. Parking is available for purchase in Fair Park, or attendees can ride the DART Green Line to Fair Park Station, which stops right at the front entrance to the event. Hours are 5 to 11 p.m. Friday, 11 a.m. to 11 p.m. Saturday, and 11 a.m. to 8 p.m. Sunday. Tickets are $20 per person at the gate (or $14 per ticket at discount tickets available at DFW-area Walgreen’s, Fiesta Mart, Tom Thumb and Albertson’s locations starting May 9). Children 11 and under are FREE with an accompanying parent or guardian. Get all the latest news and Taste happenings by becoming a fan on Facebook at http://www.facebook.com/tasteofdallas.org. This is a 30th anniversary party you won’t want to miss!